Deborah A. Rippel 56, of Minonk passed away, surrounded by family, on February 6, 2019 at Northwestern Memorial Hospital in Chicago, IL. She was born on March 1, 1962 in Joliet, IL to Gerald and Caroline (Kapraun) Glowacki. They both survive. She married Reynold Rippel on May 21, 1983 in Minonk, IL. He also survives. 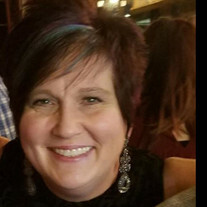 She is survived by 1 daughter: Erica (Matt) Nihells of Bloomington; 1 son: Darcy Rippel of Minonk; 3 grandchildren, who were her greatest joy: Brooklyn, Beckham, and Baby Nihells (Baby is due on March 1, 2019); 4 siblings: Cindy (Greg) Wilcox of Carlock; Geri (Bill) Moline of Minonk; Jeff (Kim) Glowacki of Normal; Christy (Todd) Goebel of Washington; many beloved nieces and nephews; and her fur babies Toby and Cheyenne. She was a member of St. Patrick's Catholic Church in Minonk. Cremation rites have been accorded to Ruestman-Harris Funeral Home in Minonk. A memorial mass will be held on Saturday February 16, 2019 at 10:30am at St. Patrick's Catholic Church. The Franciscan Friars will officiate. In Lieu of flowers the family requests that you make a donation in Deborah's honor to the Humane Society or to Illinois Cancer Care. The family would like to express their appreciation for the wonderful care and staff at Northwestern Memorial Hospital. Online tributes and condolences may be made at ruestmanharris.com.